It should have been a special time for bonding, but instead a female baboon is now grieving the death of her newborn. 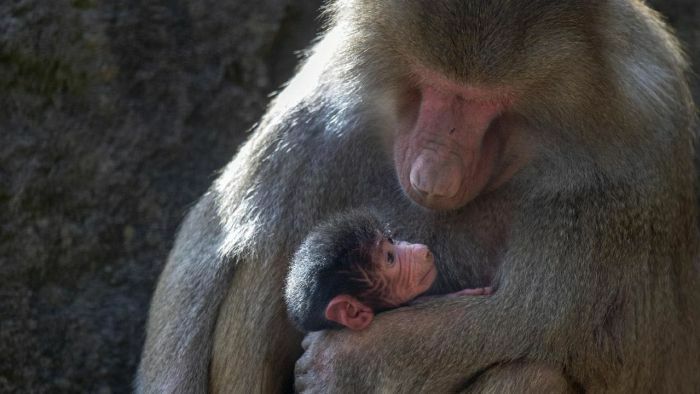 The hamadryas baboon was born in the early hours of August 25 to her mother, Chappi, and father, Horus, at Adelaide Zoo. But chief executive Elaine Bensted said on Wednesday zoo keepers had noticed the male infant was not moving and had died. They are unable to examine the infant to determine the cause of death as Chappi is yet to let him go. “We don’t know yet the cause, the mum is still cradling the infant and that’s a natural part of primate behaviour,” Ms Bensted said. “It’s normal behaviour that they would do in the wild — it’s a part of their grieving. “It’s not just the mother that’s grieving too — there’s also Tomkay, Horus and Djibouti. The baboon’s enclosure at the zoo has been cordoned off from public viewing, with keepers focused on ensuring the family was coping with the infant’s death. The zoo had planned to launch a naming competition for the infant baboon today. Hamadryas baboons are one of five species of baboon found in hard, dry areas in Africa. The latest animal death follows the death of several key attractions at the zoo, including in April the death of Chile, the last flamingo in captivity in Australia. Last year, two tigers, a hippopotamus, a female Sumatran orangutan, a sloth and an African lioness died at the Adelaide Zoo. Ms Bensted said that deaths were sadly part of the “highs and lows” of zoo life for the keepers who cared for the animals. “We’ve got over 2,000 animals in our care so we do have the highs and the lows, we have a lot of births over the year and they are always celebrated. deaths are more expected but still very sad,” she said. The infant baboon’s death comes at the same time as zoo handlers are preparing for a fifth attempt at breeding Fu Ni and Wang Wang. The giant pandas have a limited window of fertility each year around the same time as spring, with previous attempts unsuccessful. “We remain hopeful,” Ms Bensted said. For Australia’s cricketers, what is the right level of aggression?